Solar energy systems are increasing in demand, not just among homeowners but also for condo owners and apartment buildings. As solar arrays start to spring up on roofs across the country, Home Owners’ Associations (HOAs) and building managers are becoming increasingly concerned about the aesthetics of solar systems and the impact those rooftop solar frames might have on property values. Creating a clean look for solar installations is becoming increasingly important. That was the challenge facing Haleakala Solar in Hawaii. Haleakala Solar has been installing solar systems across the state for 35 years and in 2010, they started to see more demand for photovoltaic (PV) systems for condos and apartments. At the same time, the regional HOA and Association of Apartment Owners (AOAO) on Maui started enforcing new policies regarding solar system protection and aesthetics, including a mandate for skirting or barriers to hide the solar framework. Haleakala Solar had to find an easy-to-install, cost-effective solution that would conform to HOA guidelines. After talking to a number of manufacturers and distributors, the Haleakala Solar team couldn’t find a supplier with a barrier that could solve the problem, so they decided to make their own. The company started buying raw aluminum flat stock. They would have to cut and sand the stock to accept a protective coating, then ship the aluminum to a third party who would apply a powder coating, then ship it back to Haleakala Solar for installation on site. Needless to say, the process was cumbersome and expensive. In addition to having to pass the added manufacturing costs for the barriers along to the customer, it would take an additional two to three man-days just to install the barriers. When the team at Haleakala Solar was introduced to SolaTrim, they realized they had found a ready-made, robust product that would meet their needs. Tony Racinelli, the SolaTrim product representative in Hawaii, introduced the Wailea Community Association to the SolaTrim ST-001 protective solar barrier. Wailea was a big customer for Haleakala Solar, and when the head engineer talked to the solar installer about the product, they found it met all the conditions of the HOA requirements for a solar barrier for a fraction of the cost of making their own barriers. 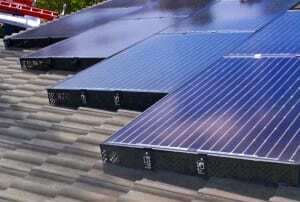 Standardizing on SolaTrim as their solar array barrier offers a number of advantages in addition to cost. Installation time was reduced from days to hours. SolaTrim comes with a military-grade peel-and-stick adhesive tested to withstand heavy winds and storms. It can be installed quickly with few tools, it won’t invalidate any solar array warranties, and it will last for the life of the PV system. SolaTrim also reduces the need for service calls since it keeps out pests that can create a mess or chew through wiring. “SolaTrim is extremely easy to install and has significantly reduced our labor and materials costs when skirting PV systems,” said Jasen Hartford, Solar Energy Consultant for Haleakala Solar. As more residential complexes install solar systems to offset electricity costs, SolaTrim will continue to be a cost-effective solution to hide the solar system framework and prevent pests from nesting solar arrays. It’s the perfect solution for installing solar arrays in paradise.